I started playing Golf 5 1/2 years ago at age 52 . I got so frustrated of shooting 125 + plus ever round for 6 months , I decided to do something about it. So I started taking lesson from Dave Predzin 5 years ago . He has taking me from shooting 125 + to a single digit handicap in 5 years ,using the Single Plane swing. I know I’m a slow learner! Dave has given his all in every lesson I have had with him, I highly recommend Dave to anybody. witnessed by my brother Mike Sweeney. On May 13, 2010 I shot my best ever score, par 72, at Rooster Run in Petaluma, CA, witnessed by my buddies Bob Hill, Mike Destiny, and Rob Clot. I attended the three-day school in 2001 at Eagle Creek in Orlando, Florida. I had only played golf for one year before attending the school and my scores were in the 120’s. After the three day session with Todd and Tim my scores dropped down into the 90’s. I proceeded to purchase all the training aids and videos, then practiced, practiced and practiced. Now at 82 I’m playing in the mid 80’s. 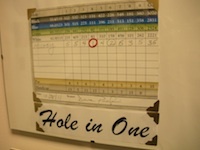 One other accomplishment, on 7/31/13 at The Walkabout Golf Course I pared the first 8 holes on the back nine, bogeyed 18. With a score of 83, almost shot my age. Tied my best 9-hole score of 37. Thanks to Swing Like Moe I’m still playing and enjoying golf as a super senior. Dave shot a personal best 74 on a course in Kent, OH, not only setting his personal best record, but shooting better than his age by 1!